Following the murders of a lawyer and journalist in Moscow, the BBC's Rupert Wingfield-Hayes asks why little appears to have been done to find those responsible. There is a tendency for many to resort to stereotypes when describing Russia. The Fleet Street headline writers rarely resist an opportunity to declare the outbreak of a new Cold War. This week there was much chortling in British newspapers at the story of a Russian airline pilot who had been forced off a plane because he was too drunk to make the safety announcement. These Russians, many will have giggled, they will never change. It is a problem I have struggled with for the last two years. How to describe this huge, complex and often frightening country? When bad things happen, like the murder of Alexander Litvinenko, there is a tendency for all of us to see it as a vast conspiracy: the work of KGB agents acting on orders straight from the Kremlin. In recent days I have had cause to look hard at that version of Russia and to ask again, what is the nature of this place? The reason has been the cold-blooded murder of two brave young Russians on a Moscow street. 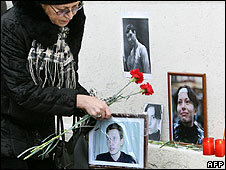 Stanislav Markelov was a 34-year-old human rights lawyer. He campaigned for all sorts of people, but most notably for Chechens brutalized in the two wars Moscow has fought to prevent their tiny republic from breaking away. The other was Anastasia Baburova, a 25-year-old journalist who investigated Russia's growing neo-Nazi movement. Their killings were cold and deliberate, straight from the set of a Hollywood gangster film. 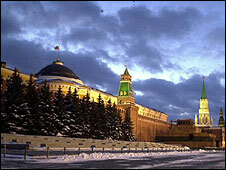 In the mid-afternoon Stanislav and Anastasia were walking a short distance from the Kremlin. A young man approached them, pulled a ski mask over his face and a silenced pistol from his pocket. He shot Stanislav in the head killing him instantly. As Anastasia tried to grab the killer he turned and shot her too. She survived for a few more hours before dying in hospital. Perhaps the most shocking thing about their deaths was the reaction in Russia. There was no huge public outcry. There were few banner headlines demanding justice. Most shocking of all was the stony silence from the Kremlin. Not a single word of condemnation came from President Dmitry Medvedev or Prime Minister Vladimir Putin. Russia collectively shrugged its shoulders and looked the other way. And then I went to Anastasia Baburova's wake, and that made me more angry. 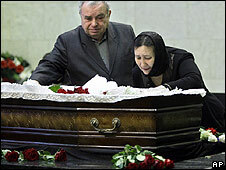 In Russia, wakes are held with an open coffin. Anastasia's face had been made up to cover the wound that killed her. She looked doll-like amid the bouquets of flowers. Her elderly parents shuffled forward to kiss their daughter goodbye. As her father bent over the coffin and stroked her face, large tears rolled down his cheeks. How could this have happened? Who is responsible? Why does nobody care? These were the questions that raced through my head as I walked from the funeral hall. In the two weeks since, I have been asking people from Moscow to Kiev those same questions. First I went to see Alexander Lebedev, the Russian billionaire businessman who owns the paper Anastasia and Stanislav worked for. I asked him who he thought had ordered their killings. In answer he described Russia as two countries, one within the other. In one, live tens of millions of ordinary Russians, in the other live a tiny elite of officials, politicians and businessmen, who together have amassed vast fortunes running in to hundreds of billions. They own private jets, houses across Europe, and yachts anchored on the French Riviera. "They will", he told me, "do anything to defend their wealth and power." 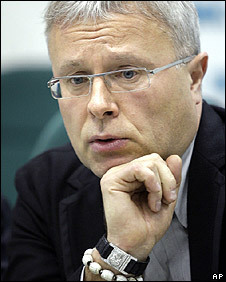 Next I went to see a man who once worked for the Russian state prosecutor's office. We met furtively in a forest on the edge of Moscow. "Would the murders of Anastasia and Stanislav ever be solved?" I asked him. "There is a very small chance," he said, "just a few percent." "In these sorts of cases an order may come down from above not to investigate," he said. "Why would they do that?" He looked at me as if I was a bit stupid. "Because," he said, "that might reveal the whole chain of people, right up to the one who ordered it." The impression that emerges is of a modern oligarchy. One where the divisions between the state and private business have disappeared, where the security services are for hire and everybody has his price. It is not a neo-Soviet state. There is no grand conspiracy. But that does not make it any less dangerous for those who stand in its way. From Our Own Correspondent was broadcast on Saturday, 7 February, 2009 at 1130 GMT on BBC Radio 4. Please check the programme schedules for World Service transmission times.